SEAN ARTHUR JOYCE: First things first. Gimme your influences! It may sound trite but in the blues especially—or any music for that matter—it’s ALWAYS relevant. Tell me why, Holly, you like Bonnie Raitt but not so much Big Mama Thornton. Or Jon, why you favour Albert King more than BB King, if you do. Talk a little bit about what makes their technique the one you like, the sound you love. Bonnie Raitt has inspired many women to play the blues. HOLLY HYATT: Some of my biggest blues influences are Bonnie Raitt, Susan Tedeschi, Maria Muldaur, Delbert McClinton, Robert Cray and Stevie Ray Vaughn. I remember watching a video of Stevie Ray when I was a kid. He was sweating and playing his heart out and it just shook me to the core. That was the real deal, soul and passion. I had the same feeling when I first heard Bonnie Raitt’s voice, and to see a female guitar player really expanded my ideas of what a woman could do as a musician. I love that Susan Tedeschi and Robert Cray create such great original blues songs. I’ve based a lot of my vocal style and phrasing on jazz singers like Billie Holiday, Dinah Washington, Sarah Vaughn, Karyn Ellison, and Ella Fitzgerald. Just hearing what these women can do with their voices is so inspiring, and I’m a big fan of hanging out behind the beat vocally. Etta James has also been a huge vocal influence for me, I learned a lot of Blues Mama phrasing from her. I love Eva Cassidy and how she uses her voice to convey the emotion and story of the songs she sings. I am also a huge fan of Jewel and Neil Young, their songwriting and poetic lyrics have inspired many songs I have written. I love Willie Nelson for his beautiful melodies and his ability to blur the lines between genres. He is just so unique. Esperanza Spalding is my number one pick, for an amazing singing and playing bass player. She is phenomenal! JON BURDEN: I think the first time I heard the blues was The Rolling Stones recording of Little Red Rooster. I didn’t know it was blues, I just knew it sounded different than all the other music on the radio at the time. It was darker, edgier and sexier than She Loves You or I Wanna Hold Your Hand, but at the same time it sounded a bit contrived, like it was an imitation of something else. It was only later, after hearing blues played by black musicians, that I realized that there was a difference. So the early Stones with Brian Jones were my first blues influences. Then, when I heard Hendrix’s live version of Red House on the In the West album, I finally got what blues was really about. He was the first black musician I heard doing blues. And then I heard Freddie King. Johnny Winter then became an influence. It’s My Own Fault from Johnny Winter And Live was played endlessly at my house when I was in junior high, so I guess Rick Derringer was also an influence because he was the other guitarist in the band and played great rhythm behind Johnny. He was also a fantastic blues soloist in his own right. Then it was The Allman Brothers version of Stormy Monday on Live At The Fillmore East. I guess I had an affinity for live albums, which is fitting, seeing as our latest album is live. In the early ’70s when I acquired a friend’s record collection, which was all black blues, is when I really became interested in that style of music. 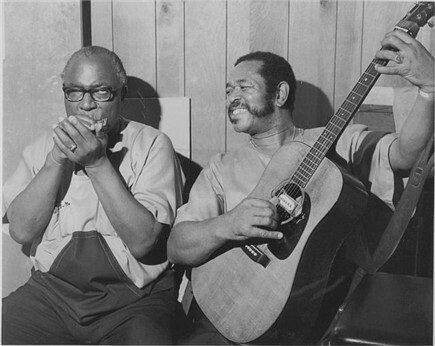 It was Buddy Guy and Junior Wells, Sonny Terry and Brownie McGhee, Otis Spann, Freddie King etc. Muddy Waters, at that time, was not my cup of tea. It was only much later that I learned to appreciate what Muddy was all about. Now he’s my man! I even drove all the way to Rolling Fork, Mississippi just to see where he was from and walk where he had walked. I did the typical thing that serious guitar players do, and that is, I started listening to the rock players and then followed it back to the roots and I’m still discovering older players today that I’ve never heard before, So the influences keep changing. JOYCE: So what about it, Jon—Freddie King, Albert King or BB King—which is it for you? The late great, underrated Freddie King. Courtesy Wikipedia. JON: I liked Freddie King more, as opposed to BB King at first, because Freddie had a rock edge and BB was too show biz or something. Now I appreciate what BB was. He was so classy and could say so much with one note. When I first heard Albert King, I didn’t get it. Then I listened to Live Wire Blues Power (another live album) and I got it! Big Time! JOYCE: It sounds like we have the same blues collection! JON: That album was a huge influence along with Freddie King’s Texas Cannonball. I wore out copies of those two albums. Buddy Guy, I always thought, played too fast, although I think Junior Wells kept him in line. I gravitate to the slower, ‘say it with one note’ players. Now I really appreciate the jump blues players, like T Bone Walker, Pee Wee Crayton, Ronnie Earl Earl, Hollywood Fats and Anson Funderburgh. JOYCE: Let’s talk about your evolution as a musician. Jon, being Holly’s father you obviously have a lot more experience to draw on. But both of you, trace for me how you see your musical arc having developed over the years to where it is today. What pushed you this way but not that? HOLLY: I started performing as a child; I would sit in with Dad on his gigs and sing a few songs. This developed into me singing more songs and accompanying him on bass. Eventually I taught myself to sing and play bass at the same time. It was a painful and frustrating process for me, because I felt like I couldn’t express myself the way I wanted to, vocally or as a bass player. It got better with practice though, and now playing and singing is very harmonious. In my late teens we started billing ourselves as ‘Holly and the Hippie’ and then ‘Holly and Jon.’ I began songwriting more and we started to incorporate some original material into our sets. In my early to mid twenties we toured a lot, playing mainly bars and cafes. We performed as an acoustic duo and a full band. All the performances helped me to get more comfortable on stage and develop my skills as a musician. I started to get pretty burned out and discouraged though. I didn’t want to be another cover band or background singer. I wanted to perform original music at concert venues, where people would sit down and listen. I wanted to engage the audience and connect with them. So I took a step back from touring, focused on starting a family and defining my goals as a musician. I discovered that music is in my soul. I must sing and share my songs, but I need to be selective in how I do that. We began focusing on promoting our original songs and performing primarily at concert venues. I have been enjoying this process and love connecting with people through music. I am excited for the next evolution in my musical life! JON: I started singing My Old Man’s A Dustman, There’s A Hole In My Bucket and Does Your Chewing Gum Lose Its Flavour On The Bedpost Overnight, and Lonnie Donnegan skiffle stuff when I was 5 or 6 at community concerts that my maternal Grandmother would organize. She was kind of a pillar of the small community in our village in England when I was young and bought me my first guitar. Then, after moving to Canada, I sort of lost interest in it for a while. I went through a cowboy phase. Then I got back into music and got serious about the guitar as an adolescent. The first song I learned to play and sing was Paint It Black and then I joined a band as a rhythm guitarist/backup singer, who sang a couple of leads. I was earning money performing before I could really play. I could play enough to strum a few chords. I was very undeveloped but music is an eternal learning experience. You just keep discovering and growing. Blues, folk and the rootsier styles of music have always appealed to me much more than mainstream stuff. Mainstream, commercial music was nice and happy, bright and hummable, but it always seemed shallow to me. I wanted something deeper, darker, earthier. When I played top 40 bands I would always bring in the obscure songs and blues material to learn. When I played in country rock bands, I’d bring in the southern rock stuff to do as well as playing as much original material as you could get away with: Which wasn’t much, as you had to be a human juke box for the most part and play songs that your audience had heard. I’ve always been attracted to the singer/ songwriters and love the early Neil Young, Jackson Browne and James Taylor albums (not much blues in those, although Steamroller Blues by Taylor is probably the best rendition of a blues song by a singer/songwriter that I’ve heard). Later, I got into the Texas songwriters such as Jerry Jeff Walker, Guy Clark and Townes Van Zandt (these latter two were very influenced by Lightnin’ Hopkins) and James McMurtry. I love it when a song can paint a picture in your mind when you listen to it. My musical taste, vision and direction haven’t really changed a great deal as I’m still embracing the obscure and like to go against the grain. I guess what pushed me in the direction I went, musically, was just trying to keep it real and say something that means something. It’s much more important to me to use music and songs as a means to make people think and open their minds, than as purely entertainment. 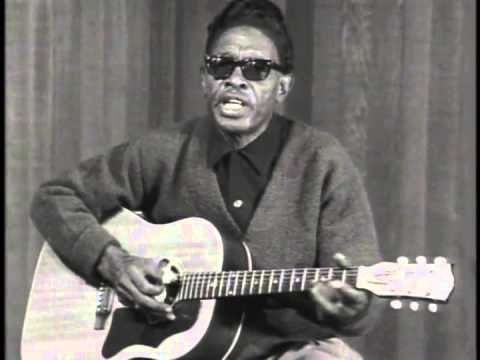 Another of the great blues pantheon: Lightnin’ Hopkins. JOYCE: How have changes in the music industry affected you? Jon, you especially have been around long enough to have seen plenty of changes, especially in terms of musicians’ earning capacities. What do you see that’s negative? Positive? JON: I came into music in the early stages of the BC bar scene. Before the mid ’70s live music was only played in Legions, community halls and cabarets. Then BC changed their liquor laws to allow live music in beer parlours. Alberta and Ontario had allowed it for years but BC has always been behind with their liquor laws. One of the people that taught me a lot about the guitar, like playing bar chords as opposed to open chords, said to me: “When they start allowing music in the taverns, I want you to be there.” And I was. At first the scene started off very gradually. A venue would try it for one night a month or something. Then they started building dance floors and stages in the venues and it exploded. Bars were hiring bands 6 nights a week and every venue had entertainment. Strippers in the daytime and live music at night. You could stay on the road continuously or get a 2–4 week residency in your hometown and then rotate. I stayed on the road. First doing a solo act, then a duo and later a full band, while still doing solos and duos on the side. I made a living through the ’70s and ’80s. In the ’90s, venues started cutting back to three nights a week, then two nights a week and then one night. Now venues don’t have an entertainment budget, so you play for the door or for tips. But, there is a positive side to these changes. By playing for the door and doing concerts, you get to play the kind of music that you want to play because the people who come to your shows come to hear and see what you have to offer and they pay attention. You’re not background music for somebody’s night out on the town drinking, carousing and fighting. Back when I was playing full time in smoke filled bars, it felt like hard work. It was a grind and there was many a gig that made me feel like packing it all in. Now that I’m able to play for respectful, listening audiences, I don’t want the night to end. HOLLY: During the past 15 years I’ve seen a dramatic decrease in the amount of venues that have live music. One of my first regular gigs was at the Prestige Hotel. I played there every Sunday night, and they had music on many other nights of the week as well. This was a common practice for venues and it enabled us to play multiple gigs in one week. The pay scale is about the same, there may be a slight decrease but it depends where you’re performing. On the positive side I think there are more community concert events and local arts councils that are supporting live music. The second biggest change for me is the lack of music education in elementary and post secondary schools. I started performing in band in grade four and continued to do so until I graduated. School band was one of the most positive musical influences in my life. I discovered jazz: Etta James, Billie Holiday, Ella Fitzgerald and the upright bass, because I was in two different big band ensembles in high school. The music composition course I took in grade 12 sparked my desire to become a songwriter. It makes my heart break that my children may not have these same opportunities during their schooling years. The high school I attended currently has no music programs at all; this is a huge disservice to our youth! JOYCE: Where do you see your art form going in future, both personally and as a genre? HOLLY: As a genre I hope Blues will open up to more diversity and be discovered and loved by the younger generations. The standards need to be shared and appreciated, so people learn the history behind the music. I hope younger artists will take that knowledge and create their own original blues songs, and then push the boundaries of the genre with those songs. Indie Blues, people! For myself, I want to focus on creating music that connects with many people and withstands many years. I want to blur the lines of the genres and mix old and new sounds. I want to sing my heart song, with soul and joy! JON: We have to find a way to draw a younger, fresher audience to the blues, as the folks that listen to blues are the baby boomers, which are an aging demographic. But, in all honesty, I think there will always be people of all ages that want to hear honest music, played by real people. This entry was posted in blues, Music, The Kootenays and tagged Holly & Jon, interviews, music, rock, Shufflin' the Blues, the blues, the kootenays. Bookmark the permalink. What a great interview. Jon’s history of the early days of the BC bar music scene was all news to me – I missed it; I wasn’t here.